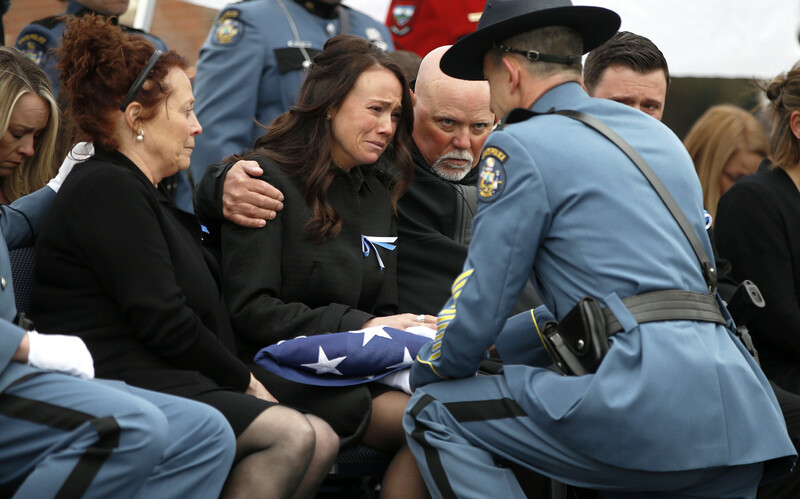 Hilary Campbell, widow of Maine State Police detective Benjamin Campbell, receives the flag that had draped her husband's casket, at the end of Campbell's funeral on Tuesday at Cross Insurance Arena in Portland. Giving her the flag is Col. John Cote, the chief of Maine State Police. Hillary Campbell, widow of fallen Maine State Police detective Benjamin Campbell, receives a folded flag that had draped her husband’s casket, at the end of his funeral on Tuesday at Cross Insurance Arena in Portland.